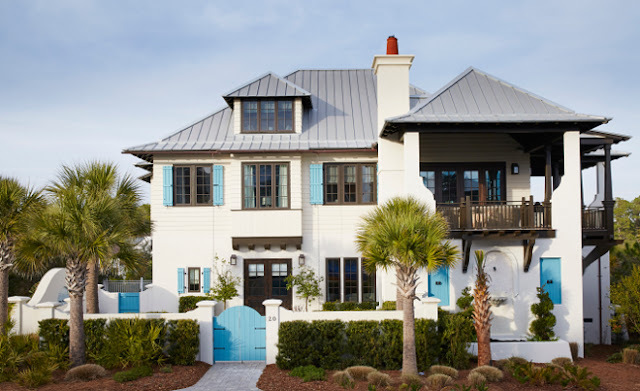 For these homeowners, Scenic 30A, Florida has been part of their lives for more than 30 years and there’s no other place they would rather spend their summers at. Tired of renting places and having to deal with high prices and the stress of scheduling dates, this couple decided to purchase a property in “The Retreat” in Blue Mountain Beach. 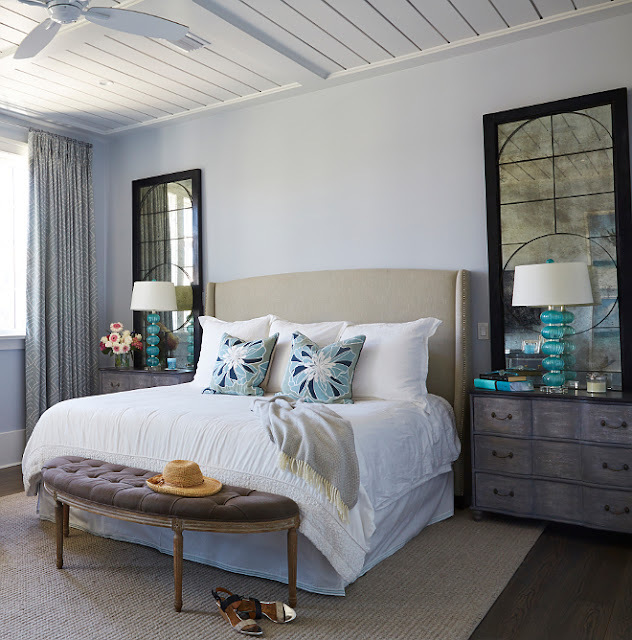 With the help of architect Tim Adams from TS Adams Studio, this beach house was designed to fit their needs and the needs of their family and friends. 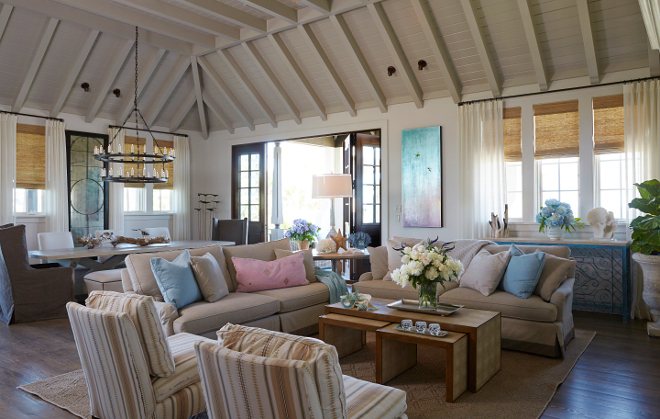 The home boasts inviting interiors with a sophisticated allure. 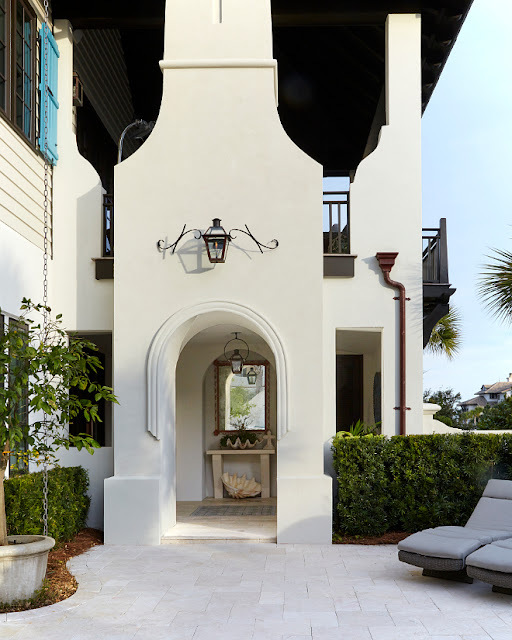 The exterior, without question, captures your attention almost as much as the ocean view seen from the second floor of the house. 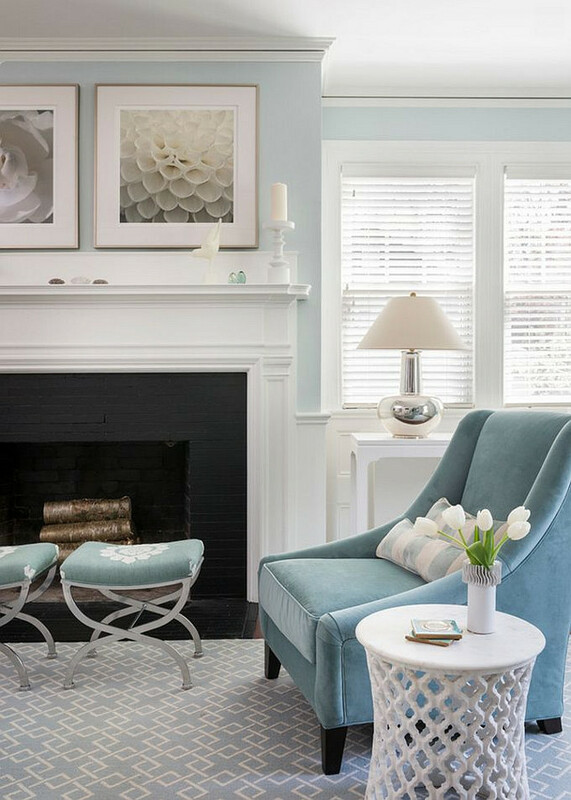 Take notes on decor, paint color and lighting. 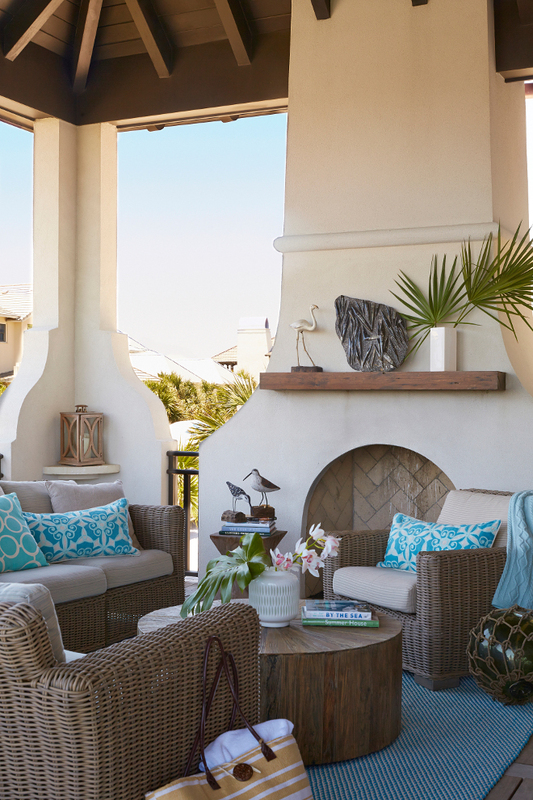 This Florida vacation home is full of inspiring interior ideas. What a curb appeal! A blue gate opens to a courtyard with fountain. 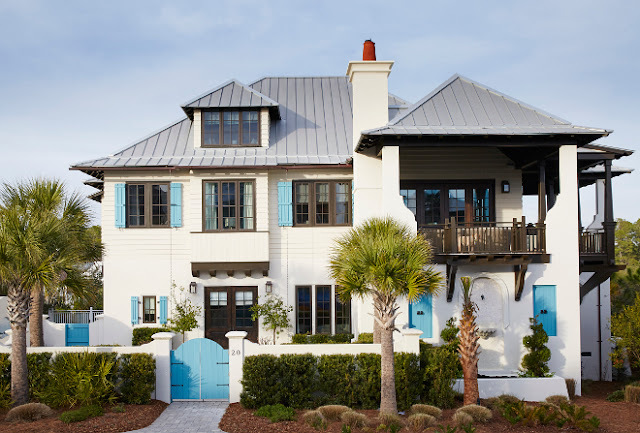 The exterior paint color is Silky White PPU7-12 Behr. The exterior of the house mixes traditional West Indies with coastal architectural details. Trim paint color is Espresso Beans PPU5-01 Behr. Outdoor lighting is by Bevolo. 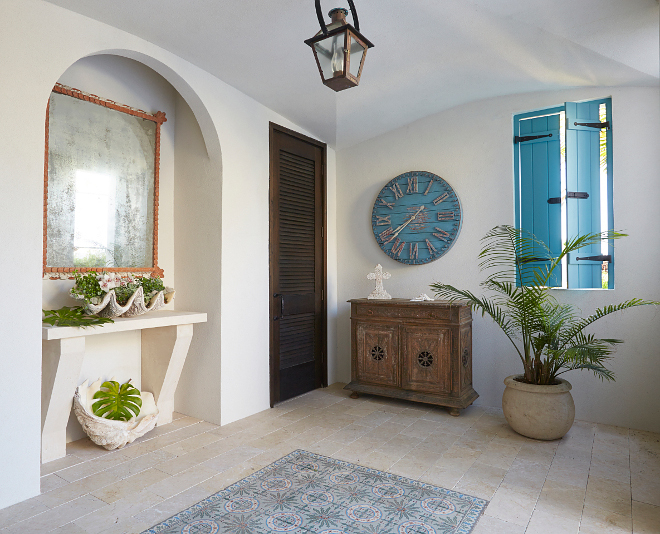 The outdoor foyer features an antique mirror and a built-in cast-concrete console. Tile is by Lantiquario Inc. 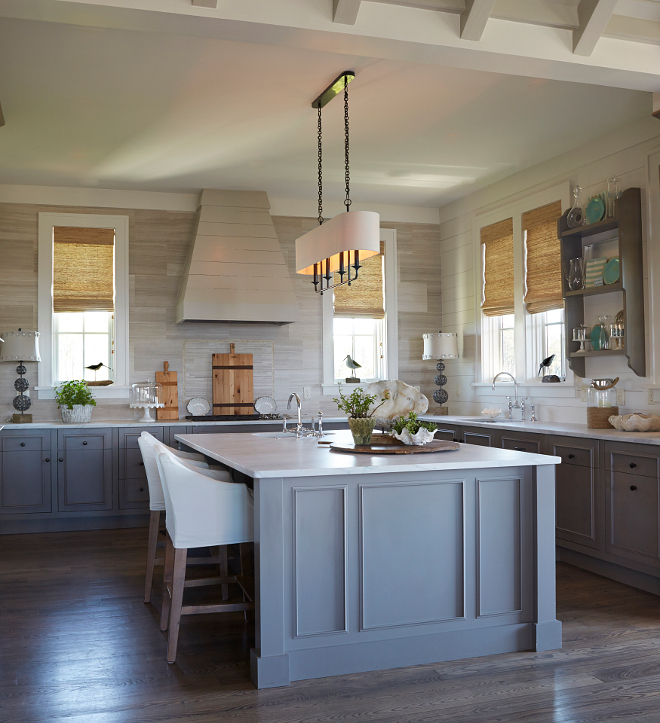 The main floor family room features pecky cypress ceilings and a wet bar with open shelves. The slipcovered furniture was done with washable, durable fabric. Sofa and chairs are Lee Industries. Coffee table is Oly Studio. Casual entertaining becomes an easy task with this open kitchen. Kitchen stools are Lee Industries. The ocean-inspired color palette with blues, grays and neutral tones create a sense of calmness in this space. The ceiling paint color is Colonnade Gray SW 7641 Sherwin Williams. 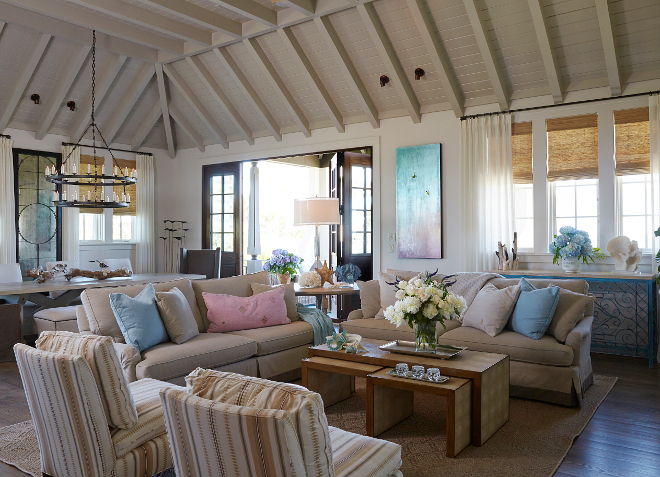 The home features an open floor plan with an inviting furniture layout. 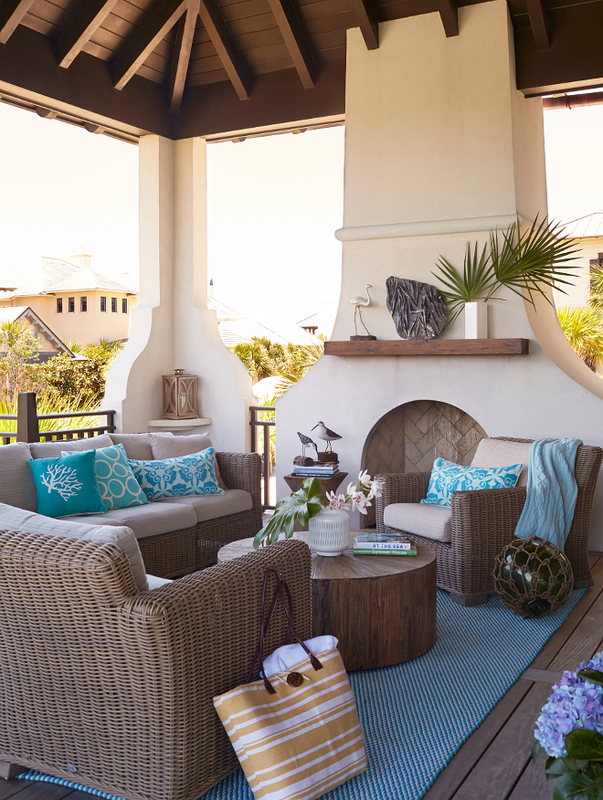 Sofa and chairs are Summer Classics. Coffee table is Gabby and rug is Dash & Albert. A wall of bifold doors connects the indoors to the outdoors, allowing plenty of ocean breeze in. The second level features a wraparound porch with incredible Gulf views. What a gorgeous spot! 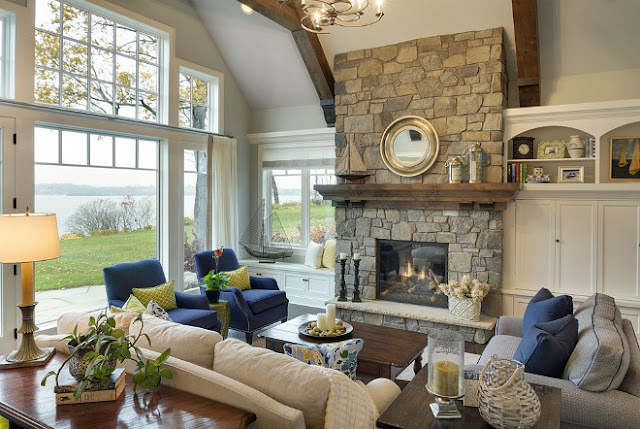 Notice the stucco fireplace. Chandelier is Bucher- Dessin Fournir. Table is Tritter Feefer Inc. The custom chairs and benches are from Lee Industries. 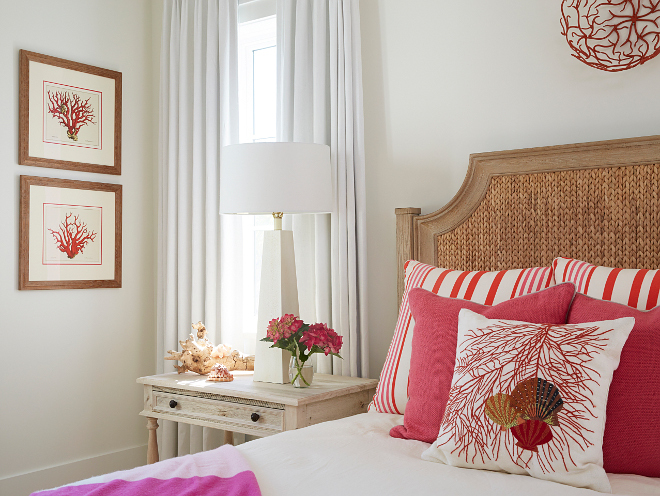 Shades of coral, red and orange brings a strong energy to the guest bedroom. Paint color is Sherwin Williams SW 7008 Alabaster. Bed is Coastal Living Resort Water Meadow Woven by Stanley Furniture. Nightstands are Noir. 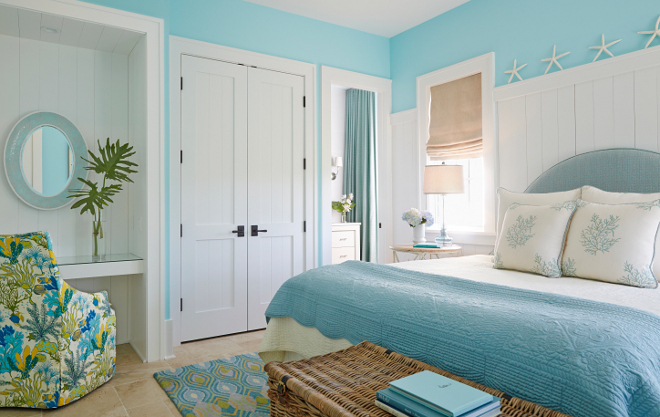 I love this turquoise bedroom with the built-in desk. Fabrics are Manuel Canovas and Cowtan & Tout. Rug is Nathan Turner. 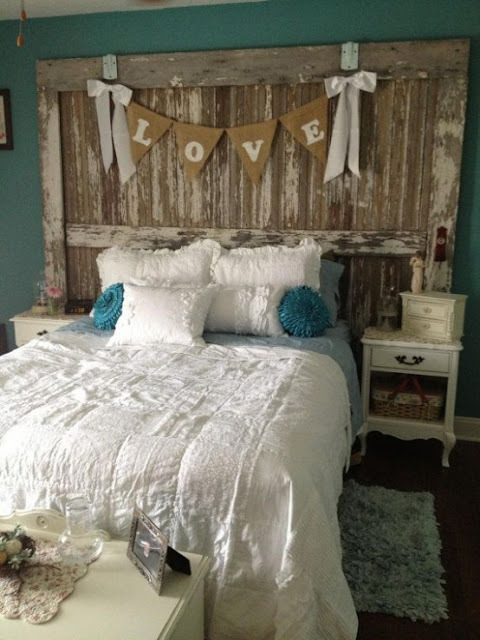 Ceiling paint color is Horizon OC-53 Benjamin Moore. Rug is Formosa in Sandstone – Antrim Carpets USA. Nightstands are Whitmore Chest. Mirrors are antiques. Lamps are Currey & Co. 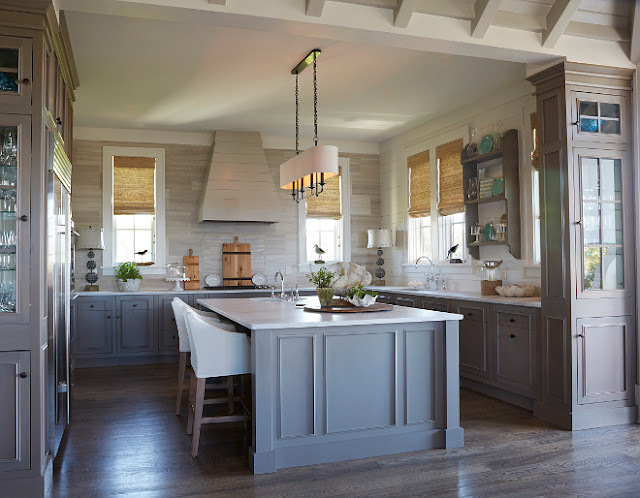 Cabinet paint color is Classic Gray OC-23 Benjamin Moore. 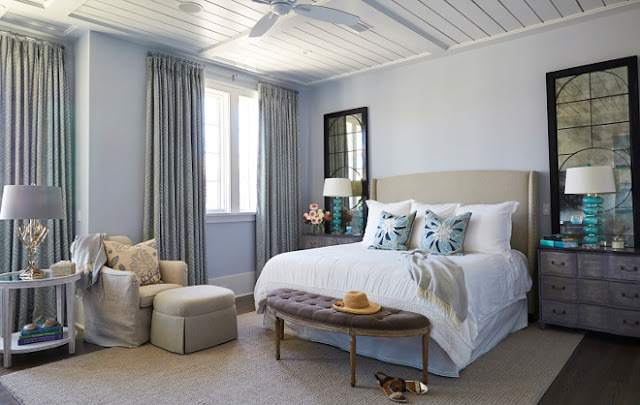 Wall paint color is Sherwin Williams SW 6182 Ethereal White. Sconces are Newell by Waterworks. Sinks are Rohl. Faucets are by Waterworks as well. 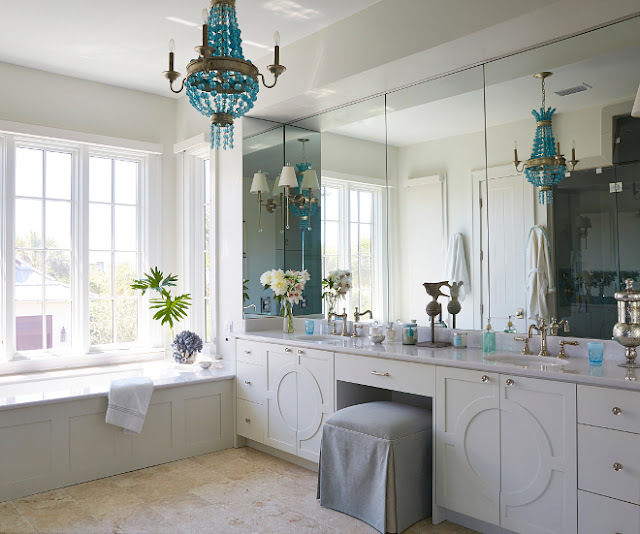 Chandelier is Serena by Currey & Co. 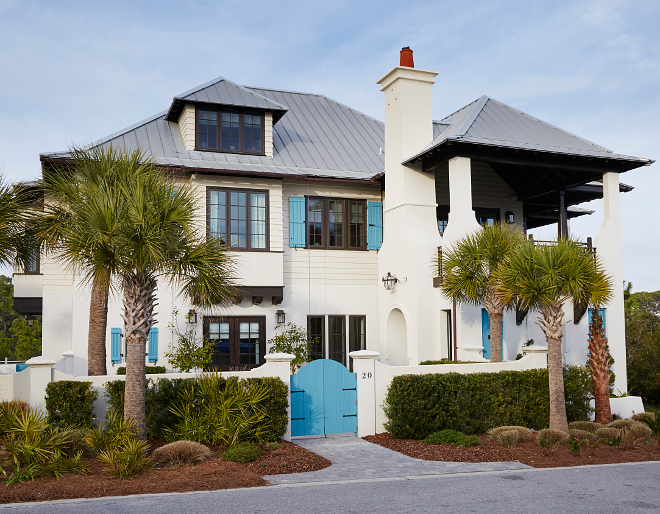 Exterior Paint Color: Silky White PPU7-12 Behr. Trim paint color is Espresso Beans PPU5-01 Behr. Shutter paint color is Tahoe Blue PPU13-09 Behr. Architects: Tim Adams & Paul Geary from T.S. Adam Studio. 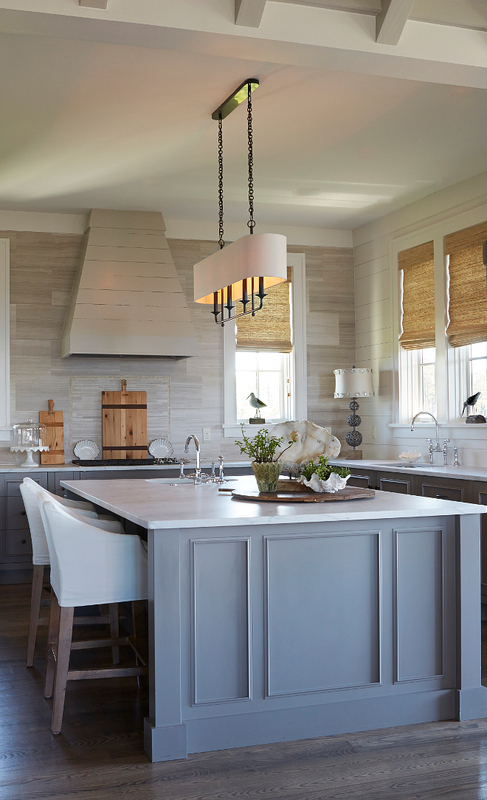 Builder: James Emerick for WaterCrest Homes LLC.